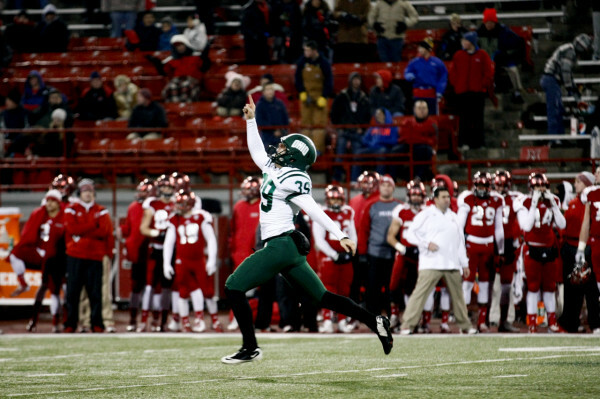 Josiah Yazdani’s 28-yard field goal as time expired capped a 21-point comeback to give Ohio a 24-21 victory over the Miami RedHawks. The win makes the Bobcats bowl eligible for the sixth consecutive season, though the Green & White aren’t guaranteed a bowl invitation. Miami (2-10, 2-6 MAC) came out of the gate roaring and went up 21-0 when Andrew Hendrix found Dawan Scott from 13 yards with 4:29 left in the second quarter, but the RedHawks failed to score for the rest of the night. It was Kylan Nelson’s 84-yard kickoff return touchdown following the Scott score that energized the Bobcats and gave them confidence going into halftime. Nelson, a freshman, took over return duties in place of Daz’ Patterson and showed off some serious speed during the touchdown scamper. See for yourselves here. Josiah Yazdani celebrates after his 28-yard game-winning field goal. Photo from Calvin Mattheis | Ohio Athletics. Ohio (6-6, 4-4 MAC) had the ball at its own 20-yard line with 1:08 remaining in the game. Vick’s 38-yard completion to Brendan Cope with 2.9 seconds left set up Yazdani’s game-winning field goal. Yazdani’s field goal was successful redemption for a missed 42-yard attempt with just under two minutes left in the fourth. The game-winner was his third of the season, the first on which came in Week 1 at Kent State. A.J. Ouellette rushed for 96 yards on 18 carries and caught a 13-yard score from Vick that trimmed the RedHawks’ lead to seven in the third quarter. He finished with 31 receiving yards on five catches. Derrius Vick completed 10 of his 18 pass attempts for 121 yards, two touchdowns and an interception. Vick, a redshirt junior, added 61 yards on the ground, but shared snaps with J.D. Sprague, who went 4 for 8 and was intercepted twice. Hendrix finished 15 of 38 for 218 yards, a touchdown and an interception. Hendrix, a senior, also rushed for 70 yards and a touchdown in his final collegiate game. Miami’s strong defensive first half was led by Quinten Rollins. Rollins, a senior and former guard on the RedHawks basketball team, intercepted two passes and returned one of them 27 yards for a touchdown. Rollins also totaled six tackles and impressed a reported eight NFL scouts that were in attendance. The win gives Ohio two consecutive victories in the “Battle of the Bricks” series. From here, all the Bobcats can do is sit and wait to receive a bowl invitation. The ‘Cats are one of six MAC teams that are bowl eligible, with Akron sitting at five wins and one game remaining.